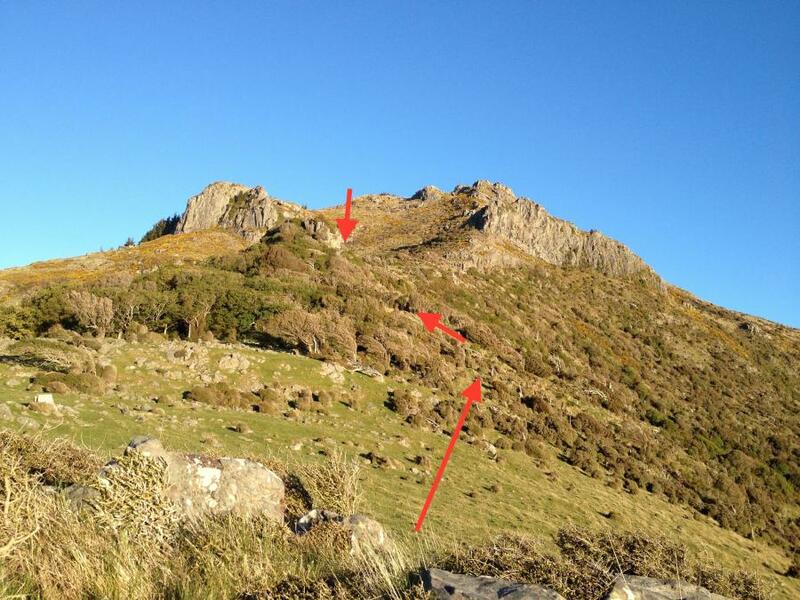 This crag is about 4 km south-west of Stony Bay Peak, Landowner: Chch City Council. There 's lots of blank rock with a few strong, long lines. It's a neat place - nice outlook, sunny, and a pleasant short walk. The first visits were probably in the 1960s, but the crag has had very little development. There are two large crags. Access is from Lighthouse Road above Akaroa. Drive south through Akaroa township. Pick up Lighthouse Rd and drive approx 3km up the hill where the tarmac runs out and the gravel begins. Hop the fence and stand on the rocky outcrop. Straight in front is the bushy thicket with a fence running along the right side, hop the fence then walk uphill towards the thin smattering of trees aiming for the small rocky outcrop. When looking at the rocky outcrop you should be able to see a line of boulders leading up to the outcrop which is a small scramble but is free of trees and foliage. Once on the outcrop its easy going to the crags. Not sure if we took the best approach as we took a lot longer than indicated! But we parked at a gate on left just past the end of tar seal and start of scrub. A short, overgrown 4wd track, then up spur. Brasenose best approached from RHS, as gorse cuts off LHS.